Hard water poses different problems,to both the residential setting and commercial setting. Imagine just one day without access to clean water through water softeners. Even the simplest task like washing your hands, cleaning your home, or preparing and cooking meals can become difficult or practically impossible. As such, it does not come as a surprise that the United Nations has recognized access to clean, potable water as a basic human right. But despite the utility and importance of water in daily life, acting as a vital tool for a diverse number of tasks, this tool is not perfect. What does water hardness mean? Water can pick up soluble bits as it passes through the ground. On one hand, this can make the water unfit for drinking and other uses. And on the other hand, water accumulates minerals found in the soil, including calcium and magnesium. The presence of these minerals in the water makes it hard. What does water hardness mean? In simple terms, water hardness refers to the volume of dissolved calcium and magnesium in the water. Water is said to be hard when it contains a high amount of dissolved minerals, including magnesium and calcium. When the source of the water supply is groundwater, the water may carry minerals which are eventually carried into homes and buildings. In particular, water in different parts of the country, including the Great Lakes region, Pacific Northwest, Texas, New Mexico, Southern California, Kansas, and Arizona are known to be moderately hard to very hard. What’s the deal with water hardness? Hard water poses different problems, not only in the residential setting, but even in different industries. For one, hard water significantly reduces the effectiveness of soaps and detergents. The presence of minerals in hard water makes it difficult for the soap to form coagulated soap curds. In simple terms, this means that you need more soap because only a small amount of it is dissolved. Additionally, hard water causes insoluble curd to stick to the skin and prevent true cleansing. This can also lead to dull and lifeless hair. When hard water is used for washing clothes, this can cause the dirt to be trapped into the fibers and make clothes stiffer and rougher. Hard water can also leave behind insoluble soap deposits which can leave marks on different surfaces, from dishes to your car. The buildup of soap film can also happen in the bath and shower. The calcium and magnesium in hard water can accumulate inside the pipes. When that happens, water flow can become restricted. The presence of hard water in water heaters can lead to the formation of scale which can diminish the efficiency and lifespan of the heater. Hard water can also affect different industries. For example, in the textile industry, hard water can affect processes like dyeing, washing and finishing. In the beverage industry, the use of hard water may alter the color, taste and odor of drinks. There are plenty of solutions that can be used to remove magnesium and calcium from hard water. The most popular of these is the use of water softeners. A water softener is a mechanical device that is attached to the water supply system. This device operates by using the process known as ion exchange where the minerals present in hard water are exchanged for another mineral, typically sodium or salt. 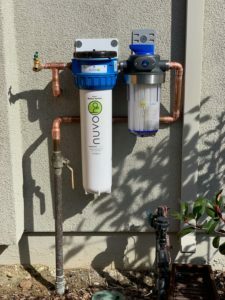 But despite the benefits of removing calcium and magnesium from hard water through the use of a water softener, many people still prefer to use hard water instead of installing a water softener. 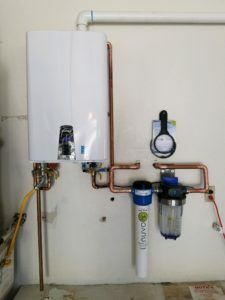 The main reason behind this is that using a water softener entails the use of a huge amount of salt which can be tedious work. Also, salt-based softeners can be difficult to maintain. NUVO, through its line of softeners, eliminates many of the hassles associated with salt-based softeners. Unlike other softeners which require regular replenishment of salt, NUVO uses cartridges. One cartridge is equivalent to hundreds of pounds of salt and can last from six months and beyond. The cartridge, which costs the same amount as salt, can be easily replaced. NUVO’s line of water softeners can remove existing hard water scale and prevent its build-up in the future. And because these softeners do not use salt, waste water is eliminated. Plus, these softeners do not require electricity. The softeners have a compact design which means that it can fit anywhere. The softeners can also extend the life of your water heater, plumbing fixtures and appliances. NUVOH20 water softeners treat hard water in two ways. First, the softener chelates and isolates the calcium ions. These prevent the ions from precipitating out and forming scale. Then, NUVO’s softeners lower the water’s measured pH level which can reduce or even eliminate scale formation. Chelation involves the binding or stabilization of mineral ions found in hard water. NUVO’s CitraCharge contains a chelant which creates a ring structure that binds the ions to the CitraCharge. The formula of the CitraCharge eliminates the problems associated with hard water by making the minerals separate and stay apart from the water. Since these minerals are bound, these can pass through metal pipes, dishes, fixtures, appliances and even your body without risking the formation of scale. CitraCharge uses citric acid as its primary ingredient. Citric acid is an organic acid that is naturally found in fruits and vegetables and has natural chelation properties. And because hard water is almost always alkaline, the introduction of citric acid into the water can reduce the water’s pH level and reduce its potential to form scale. Provide cleaner water for your family and get one of NUVO’s saltless water softeners installed in your home, call 831-630-3000 today!